This laminated menu will be protected if this restaurant-goer places his beer on it. Do you offer lamination services? Lamination is a great way to keep documents, signs, and reading materials safe from moisture, dirt, and damage. Read on to learn more about how lamination extends the life of important materials by protecting them from damage. Have you ever accidentally left your drink sitting on top of the menu at the bar? Good thing the menu is laminated! 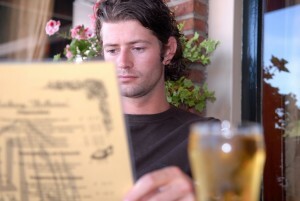 Restaurant menus undergo a lot of wear and tear from restaurant-goers. Since food and drink are constantly in close proximity to paper menus, it’s a good idea to protect the menus by sealing them in protective plastic. Restaurants that use plain paper menus have to reprint new menus every day! That’s a lot of waste. By laminating your menus, you’re saving a lot of money in printing and materials costs. If you’re hanging a sign in a facility where it’s likely to get dirty, then there’s really no point in using the sign if it’s not laminated. Either you’ll have to keep replacing the dirty sign, or the sign will go unread as it decays from dirt and sun exposure. A laminated sign can be displayed for years without ever having to worry about it. A paper card doesn’t last long inside a wallet where other cards are constantly being moved around. Sometimes it doesn’t make sense to spend money on giving clients a plastic card. However, you don’t want to provide clients with a card that they will use often, like a membership or club card, that’s made out of fragile paper. A paper card gets bent, torn, and worn. A laminated card is an affordable alternative that looks professional, is easy to use, and will help you attract and retain clients. If you are creating tabletop displays, sales presentation materials, or showroom and trade show materials, then laminating your materials will give you a professional edge. What’s worse than setting up for an important presentation and turning around to see that someone knocked a glass of water on your materials? By laminating your materials, you can rest easy that they will be safe and undamaged when you need them most. This entry was posted on Friday, March 25th, 2016	at 4:12 pm	and is filed under New printing equipment	. You can follow any responses to this entry through the RSS 2.0	feed. Both comments and pings are currently closed.